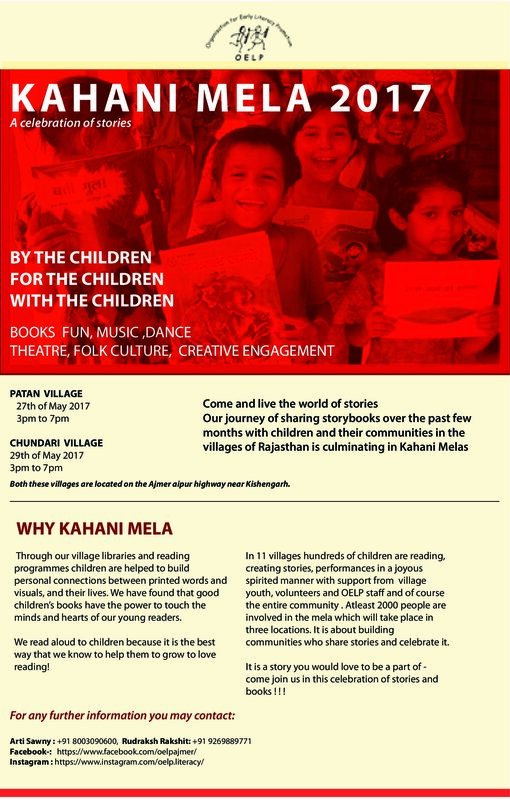 I was enthralled when I came to know about the Kahani Mela and I wanted to come here to experience the village life and volunteer with OELP.Missing this wonderful opportunity would mean missing the fun filled activities with the kids,re-living my own childhood with them,knowing about village and the community life,their customs,culture,language,food in and out.I have always wanted to experience such village life as I do not have my native place as a village. Secondly,being a mathematics student, I wanted to know more about pedagogy of language and wanted to engage in those activities that could be done with language. Now,if I come to the process of organising the Kahani Mela.I really loved the fact that “OELP” gave me the opportunity to implement what I have learnt in B.EL.ED and that the OELP team was always open to our feedback and suggestions.We had regular meetings about how to organise the mela,what all we need,what all has been done and what else needs to be done.All of us were actually involved in the planning process,shared and learnt from each other’s ideas and experiences. Among the experiences that I will always cherish are the experiences I had with the community. Each and everyday brought a new learning experience.The people were very warm and welcoming.It seemed that we knew them since ages and the bond between us grew leaps and bounds within few days. We tried to know about each other’s culture.They even offered us to dress us in their traditional attire.The lunch on the very first day had a great impact on me. Our lunch was organised by the community members.When I went to a family for lunch,a woman served us onion curry and chappatis. Frankly speaking,if it was served to me at my house, I wouldn’t have eaten it or would have shown tantrums and ordered food from outside.But she served it with so much love and tenderness that we couldn’t say no or disrespect her, it was not about the taste but the feelings attached to it. Though coming from a different social and economic background, serving food was a big thing.I felt that I might have been becoming a burden for her.Simultaneously,it made me feel guilty as to how I show tantrums to my parents,or in general how some of us waste so much of food and do not give it a second thought before throwing it away.It was a very overwhelming experience and left me in tears. 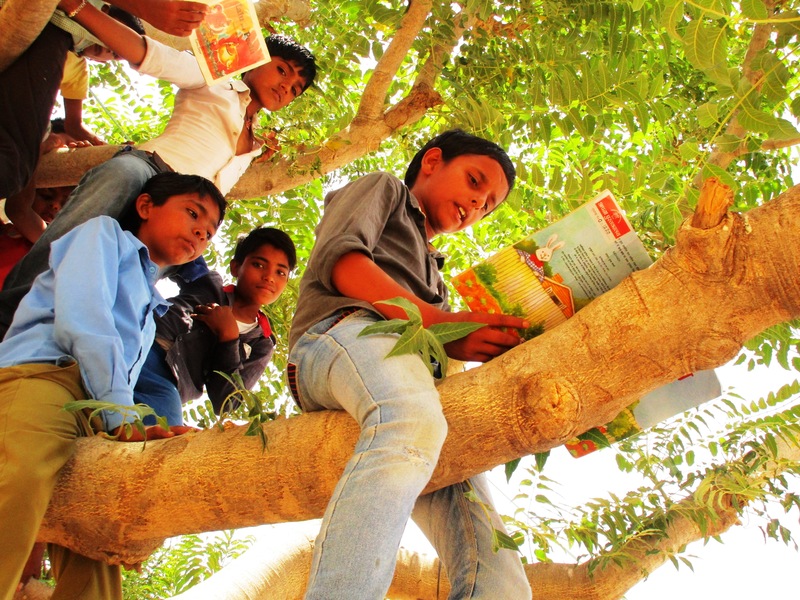 We often talk about how pivotal is the role of community in the process of schooling and how it can be used as a resource.At,OELP,we actually experienced that.Community was so much involved in organising the mela that without their help it wouldn’t have been such a success. I facilitated the students in developing their own stories,plays,puppet shows,poems,games treasure hunt,storybooks and so on and mobilised the community.The student’s enthusiasm and zeal motivated me to do a lot of work and engage with them wholeheartedly. We talk about originality, spontaniety and expressions in child’s language,the same was visible here.Children weren’t doing things just for the sake of it,but were actually understanding the processes and then doing it. Also,their experiences were used as a rich learning resource.A girl lost her slippers and she found them the very next day.When students were asked to write their own story,she wrote her experience of loosing her slippers and how she found them.Here she was given an implicit message that her experiences are being valued and that a child can also write books.Similar opportunities were given to them to explore their village i.e through village stories,village map and treasure hunt,Gaon ka itihas where they asked their elders about how their village was formed,the flora-fauna of their village and so on. It was indeed a great learning experience for me and a beautiful opportunity to meet new people,know and learn about their cultures.The homely environment,living together with new people, sharing and caring, the democratic setting with lots of opportunity to gain and learn from each other’s experience were eye opening for me. I learnt a lot from these experiences that I probably would have learnt a lot later in life if I didn’t come here as a volunteer. I came here to work and share my skills and learn from new experiences, but here, I also made friends for life.